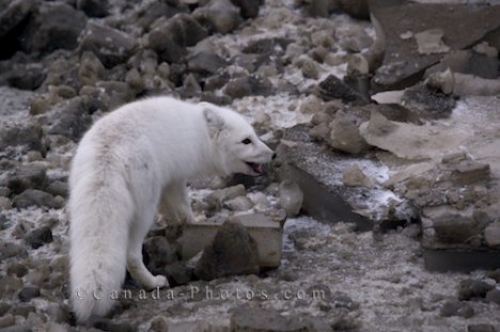 The Arctic Fox in this picture is an animal that has a coat of white fur in the winter around the Hudson Bay in Churchill, Manitoba to protect itself from any predators. Tours along the Hudson Bay in Churchill, Manitoba are not just about Polar Bears, as this Arctic Fox is another type of animal that we were able to capture a picture of. His white coloring during the winter season helps protect this Arctic Fox from any danger that may be lurking around the shores of the Hudson Bay. When spring approaches the coloring of the Arctic Fox changes to blend in with the landscape. Arctic Fox, Alopex lagopus, foraging on the tundra in the Churchill Wildlife Management Area, Hudson Bay, Churchill, Manitoba, Canada. Picture of a snowy white colored Arctic Fox, one type of animal that explores the shores of the Hudson Bay during the winter.